Luke Diiorio, the salmon run, 2017, oil and wax on canvas, mounted folds on panel, 162.6 x 121.9 cm, 64 x 48 in. Courtesy Pippy Houldsworth Gallery, London. Copyright the artist. Luke Diiorio, untitled (maroon, midnight blue, flesh), 2017, oil and wax on canvas, mounted folds on panel, 162.6 x 121.9 cm, 64 x 48 in. Courtesy Pippy Houldsworth Gallery, London. Copyright the artist. 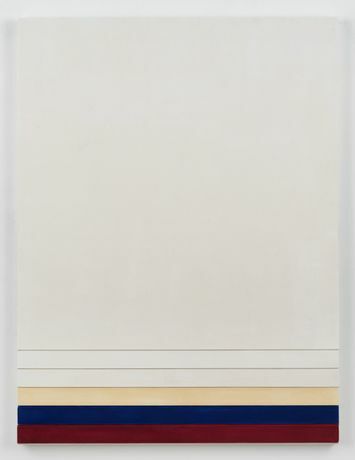 Luke Diiorio, Untitled, 2017, oil and wax on canvas, mounted folds on panel, 162.6 x 121.9 cm, 64 x 48 in. Courtesy Pippy Houldsworth Gallery, London. Copyright the artist. Pippy Houldsworth Gallery is delighted to present Luke Diiorio’s second solo exhibition with the gallery from 28 April to 3 June 2017. Pippy Houldsworth Gallery is delighted to present Luke Diiorio’s second solo exhibition with the gallery from 28 April to 3 June 2017. The exhibition comprises a new series of paintings which further explore the formal properties of folding and how the fold itself has become a new type of surface. Like Kenneth Noland’s use of horizontal stripes and concentric rings, Diiorio asserts the presence of colour in this body of work. 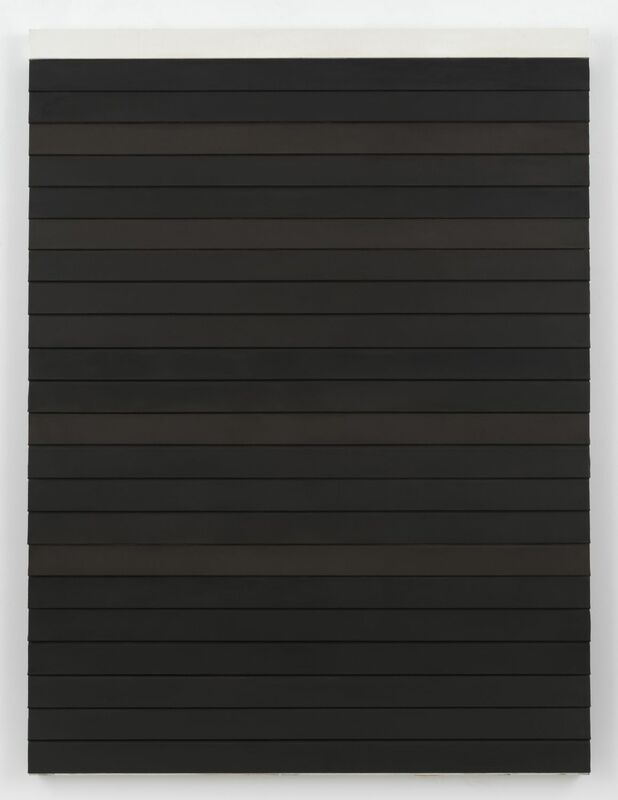 However, whilst Noland sought to integrate colour as closely as possible with the canvas in order to emphasise its flatness, Diiorio instead seeks to break up the picture plane. Bands of colour are both visually and physically separated; a distinct boundary is delineated by the artist, isolating the surface of the canvas and all that happens within its confines. Diiorio shifts emphasis from the performative act of folding, as manifested by his earlier work, to instead focus on the actual surface that is generated. For instance, subtle and diffused variations in tone, achieved by mixing beeswax into the pigment, become heightened due to this focus. Despite this isolation, the viewer still reads each component in relation to one another. Where paintings were once composed of folds of varying size and thickness, the artist has modulated the bands of fabric in this new series, emphasising minimal differences which arise between them. Here, the fold becomes a unique vehicle for content. About Luke Diiorio Luke Diiorio (b. 1983) is a US artist whose minimal, folded compositions play with notions of visibility and materiality. Diiorio was born in Philadelphia and now lives and works in New York. He received an MA from the Royal College of Art, London in 2013. Recent exhibitions include solo presentations at Pippy Houldsworth Gallery, London and Anat Ebgi, Los Angeles. 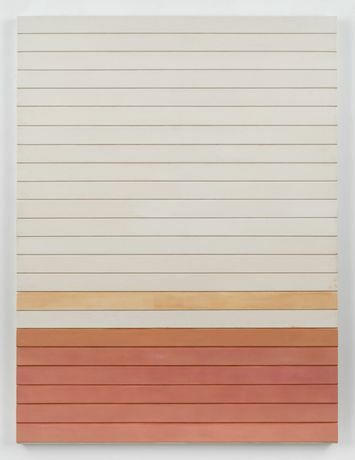 Recent group shows include those at Super Dakota, Brussels and Kinman Gallery, London. His work has been profiled in Interview Magazine; Art in America; Wall Street Journal; This is Tomorrow and The New York Times. Pippy Houldsworth Gallery presented a solo booth of Diiorio's work in the Discoveries sector at Art Basel Hong Kong in 2016. A profile written by leading writer Alex Bacon will be published by The Brooklyn Rail to coincide with the exhibition.